What’s So Nice About Salade Nicoise? It started off simply enough: A cold dish of oil packed canned tuna from the Mediterranean garnished with tomatoes, anchovies, hard boiled eggs, and, of course, tiny, briny Nicoise olives. Some chefs included red peppers, shallots and artichoke hearts, and it usually arrived on a bed of greens, all dressed in a light vinaigrette. While myMEGusta is usually all in favor of “truth in menu”, the ubiquitous Salade Nicoise we see today has strayed so far from its origins that it hardly matters any more. This is one item where you really do have to read the menu description in detail to avoid surprises. For example, you rarely see the red peppers, shallots and artichokes now. Chefs often bow to consumer qualms and leave out the anchovies. On the other hand, it always arrives with cooked potatoes, usually with cooked green beans as well, despite an early historical reference to “no cooked vegetables.” All to the good, if you ask me. Even better when they eliminate the hard boiled eggs. Having originated in, or been named for, the French city of Nice, sadly the scene of a recent tragedy, this dish represents the tastes of the Mediterranean. Julia Child can be credited with really popularizing it in the United States, and her preparation used potatoes and green beans. This leads myMEGusta to believe that her version was served in plenty of French restaurants and homes, and, while not historically perfect, a very accurate rendition of what real people were eating and enjoying in her days there. Not so long ago, really good canned tuna was appreciated by everyone, and you’ll still find it in gourmet shops everywhere. Now, this is neither the virtuous water packed albacore which most people seek out today for their mayonnaise laden tuna salads, nor it is packed in insipid mystery oil that needs to be washed off before using. Oh, no, this tuna is packed in top quality extra virgin olive oil, and that olive oil goes straight to the plate to be sopped with crusty bread, or made into a vinaigrette. 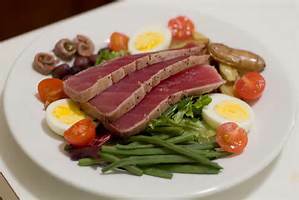 Nowadays, you’re more likely to find a Salade Nicoise made with seared yellowfin tuna. By the way, this makes for a really excellent dish. In as unlikely a spot as Jackson Hole, Wyoming, myMEGusta recently enjoyed a so-called Salade Nicoise made with excellent Idaho Rainbow Trout, smoked in house, accompanied by crunchy green beans, purple potatoes, house cured pork belly, and crisped onions, all in a light mustard mayonnaise dressing. The restaurant is called “Local”, http://localjh.com/ , and this is what we call good cowboy dining! Here we go again about the names and composition of dishes. First about the canned tuna fish. 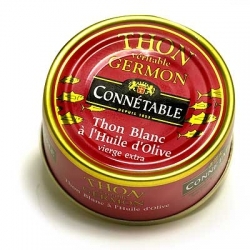 When I worked in Geneva the tuna came in large, heavy and bright red cans. The flesh was slightly pink and rather solid. It was expensive and every portion was weight put. We still managed to snack a little since it was so delicious. 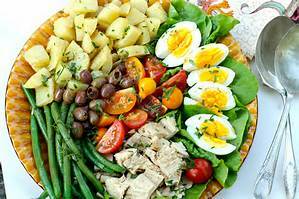 Salade Nicoise consisted always of the mentioned tuna on a bed of haricots verts (string beans), some potato slices, tomato wedges. 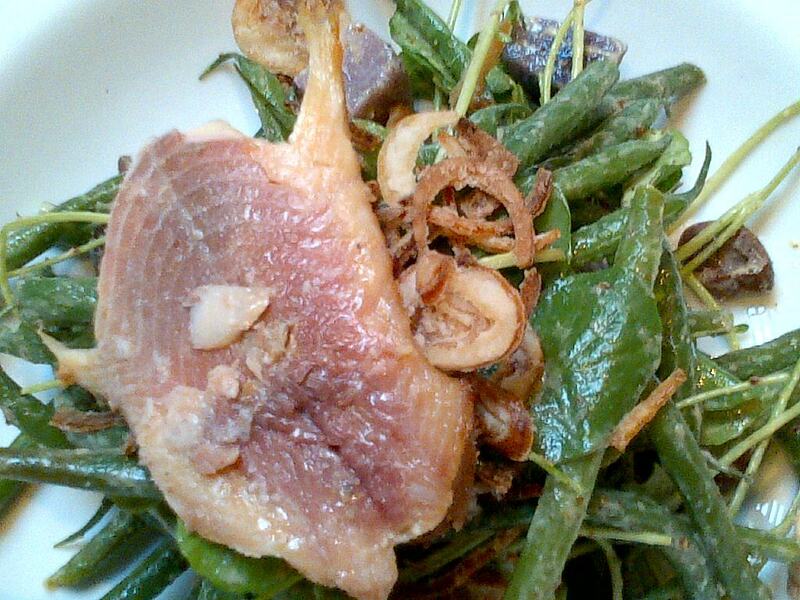 capers and anchovy fillets. To refresh my memory I looked in the Escoffier Guide Culinaire English edition 1921. Surprise, surprise the recipe in the book does not mention tuna fish! So here we are again, what is authentic?